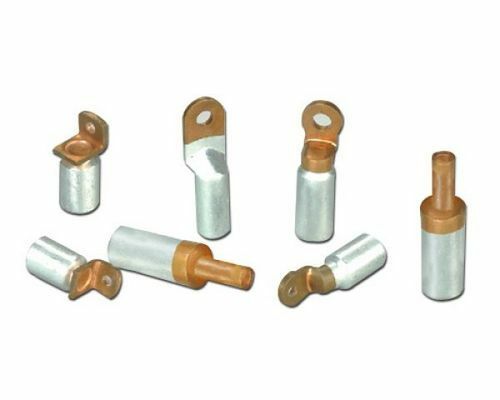 We offer a wide range of Bi-metallic Connectors, which is a method of securing a conductor to a conductor by using special tool to produce permanent deformation of the connector & conductor. These Bi-metallic Connectors are used for joining aluminum & copper circular conductors. The connector is particularly useful, when copper is used as earthing in aluminum lightning protection systems. Established in the year 2003, in Surat (Gujarat, India), we “Vidhyut Electrical” are an ISO 9001:2008 Certified entity engaged in manufacturing, trading, exporting and supplying of LT XLPE Cable, HT XLPE Cable, Copper Multicore Flexible Cable, Building Wire Rubber Cable, Rubber Cable, ACSR Conductor, Cable Tray, Industrial Switchgear, etc. These products are manufactured using advanced technology and quality tested raw material in order to meet the international quality standards. Acknowledged for their features such as precisely manufactured, flexible, durable finish standards, high tensile strength, flexibility, easy installation and shockproof, these products are highly demanded in the market. Also, We are Trading and Supplying of premium quality HT Insulator, Cable Tray, Lighting Fixture, Industrial And Domestic Fan, Industrial Switchgear, Busbar Chamber System, etc. The offered range is obtained from reliable and licensed vendors of the industry. We have selected our vendor on the basis of their product quality, production techniques, timely delivery, market reputation, economic position and industry experience. We mostly export our product to South Africa And Gulf Countries.We are also Keenly interested to do business in our state GUJARAT.